I went into BENEATH THE VOID expecting Sadie to be just recovering from the terror of the last novel, but instead, the novel opens with Sadie working a shift at Moe's Diner. The girl has gone out and gotten a job to fill her time, and she's a busy girl. She's taken on so many responsibilities to keep herself from remembering the horrors of that horrible day when Ian and Newton tore up the school with gunfire. Sadie's so busy trying to occupy her time, she doesn't see the true story of all that's going on, and she can't see the truth, either. I loved this book and how the issues confronted in it were so true-to-life. The bullying that Sadie watched and contributed to by silence is now being turned on her, in a heart-breaking manner. And then, it goes even further when one of her cyber-bullies starts taking things too far, outside Twitter and social media. The way Dane confronted things like PTSD, eating disorders, and bullying was very accurate. I suggest the book on this alone (no spoilers, though!). It'll make you think: can a tiger change it's stripes? Good question to ask. A great read, and I can't wait for the next! I quietly stepped out of the bathroom as Britt dove toward the toilet again. She was probably too busy emptying her stomach to realize we were talking about her, but I didn’t want to take any chances. The girl had a knack for acquiring information, and knowing just about everything about everyone. I didn’t want to give her any fuel to possibly use against me in the off chance this nice new personality of hers was an act. The cool tile flooring felt nice against my bare feet as I padded my way down the small hallway toward the kitchen. I needed something to wash away the awful taste in my mouth. “I don’t know,” I said as I rifled through the cupboards, finally coming across one that held a bunch of glasses. I plucked one down and made my way to the nearby sink. “I think maybe she’s different now. The shooting … it changed her. It changed all of us. She’s having nightmares. Like me. I thought maybe I could help.” Myself. I selfishly thought I could help myself. Nothing I’d done last night was for anyone but me. Why was I lying to Hayden? What kind of person had I become? The tap water didn’t do much to rid my mouth of the awful vomit taste that lingered, but the cool water felt good against my throat. I drank the entire glass, then filled it up again. Elisa Dane loves books, chocolate, reality television, her family, and All Star Cheerleading. Not necessarily in that order! She writes contemporary YA romance with cheerleaders. Yep. She writes what she knows, and it's her hope that her stories will not only take you on a romantic journey that will warm your heart, but that you'll find a new respect for the sport of All Star Cheerleading you may not have had before. She's represented by Brittany Booker of the Booker/Albert Agency, and has published a New Adult paranormal series under her real name, Lisa Sanchez. 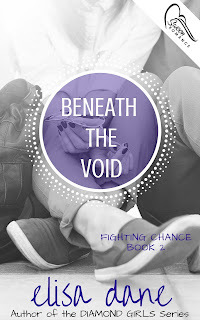 Win a $10 Amazon gift card and an eBook copy of BENEATH THE VOID.